The NEW M12 LED High Performance Flashlight establishes a new benchmark for 12-Volt Flashlights, bringing new levels of versatility, performance and durability to the industry. Its powerful LED produces 800 Lumens of high definition light output, and it can cast a beam beyond 375 yards. The 2355-20s sliding head allows users to adjust their beam pattern from a flood to a spot effortlessly, and it features three output modes for high, low or strobe use. The body is built from machined 6000 Series Aluminum with a type II anodized finish and can handle anything it may encounter through years of professional use. 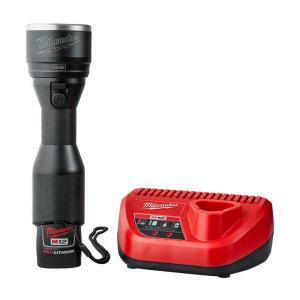 Tbook.com crawls the web to find the best prices and availability on Flashlights and related Tools and Hardware products like Milwaukee M12 12-Volt Lithium-Ion Cordless LED High Performance Flashlight Kit W/ (1) 1.5Ah Battery & Charger. For this page, related items include products we find that match the following keywords: "Flashlight" at our vendor partner Home Depot. Milwaukee M12 12-Volt Lithium-Ion Cordless LED High Performance Flashlight Kit W/ (1) 1.5Ah Battery & Charger is one of 152 Flashlights and related products listed in the Tools and Hardware section of Tbook.com If you have any questions on this product, please give us a call at 734-971-1210 during the hours of 9am - 5pm EST for assistance. Thank you for shopping at Tbook.com, the Internet Department Store!